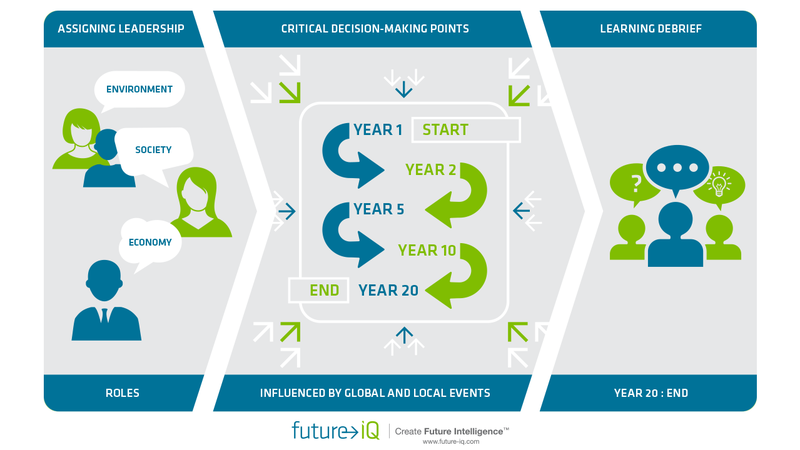 Our unique simulation tool, Future Game® allows you to test your strategic decision making skills, as you are guided through a set of critical decisions over a 20-year period. Future iQ®’s unique Future Game is a premium quality future planning simulation tool. It provides stakeholders with a dynamic Gaming experience rewarding collaboration, innovation and teamwork. An in-depth debrief at the end of the game enables participants to apply the learning from the Game to their own decision making and planning. “The Future Game” is a registered trademark in Australia. The Future Game® allows people to explore a range of plausible outcomes, generated through their own decision-making. Teams learn how decisions that seem sensible in the short-term, may have the potential to play out in unpredictable ways. This unique process enables individuals within teams to make decisions for a hypothetical situation in a hypothetical region. This challenges status quo thinking and demands collaboration, teamwork and engagement. The Future Game® stimulates strategic future thinking and planning, and integrates external trends to local decision-making. Following the Future Game® participants discuss and learn how The Future Game® experience is relevant and applicable to critical thinking and decision making in their lives and work. Future iQ has been applying and developing The Future Game for nearly a decade. In that time, more than 25,000 leaders and stakeholders have played the Future Game across a range of regional, industry, government, corporate and community settings. The Future Game® is a dynamic workshop process. Collaborating in teams, you will make key strategic decisions for a hypothetical region over a 20-year period. Responding to a series of difficult choices, you arrive at one of a range of critically different futures. The game debrief allows you to learn from your decision-making approach and assumptions.